March was another positive month at Quadrant. It saw the release of a product update as part of the rollout of our microservices layer: our AI models. These models greatly increase our customers’ ability to use and interpret our data. And as always, our team was active in and around Singapore, speaking at events relevant to the data space and sharing knowledge with the community. Here are some highlights. This month we launched a set of new AI tools to help our customers better use location data to target the audiences they need to reach. Our AI algos and models are part of a new microservices layer designed for location intelligence organisations to find specific audiences with greater ease. These algos and models work on the raw location datafeeds and provide actionable intelligence and information from specified location areas. This helps data professionals target a range of audiences -- from football fans around a stadium to tourists near an attraction to diners who frequently visit a restaurant chain. Organizations can take advantage of the models to find shoppers who frequently visit a mall, potential drinkers in the vicinity of a bar, or tourists likely to have been through a specific airport. The Point-of-Interest model can also be used by urban planners to understand travelers’ habits and see how long it takes them to pass from one point to another or to identify their preferred routes. We are pleased to announce an agreement with Quorum Data, a U.S. based data-driven solutions provider focused on the out-of-home (OOH) advertising space. Under the terms of the agreement, Quadrant is delivering user mobility data relating to specific geographic regions. The volume of data provided is projected to scale up significantly over the first year of the agreement. Quorum’s business model requires user mobility data at scale. To date, no data provider has been able to adequately meet this essential need. Additionally, Quorum needed to increase the size of its data panel. Quadrant was able to solve this problem and meet Quorum’s needs by filtering data based on a regional polygon - a capability no competitor was able to match. We anticipate a long-term relationship with Quorum and are excited to be working with them to scale their data while ensuring it is meeting their needs and those of their customers. The Quadrant team has once again been actively participating in industry events in Singapore. CEO Mike Davie outlined how companies can work with Quadrant at the Decentralize IoT Asia conference. 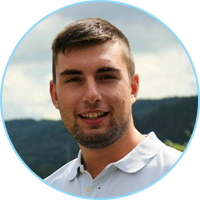 Mike explained how advertisers better measure their brand awareness with Quadrant’s mobile location data and how they can boost user experience with super-local app targeting. “We help all these different data sets come together, build new products and then … we bring those to companies who are looking to solve a problem.” See video of Mike here. Senior Data Consultant Glenn Harrison led our monthly meetup in Singapore that focused on mobile location data for out-of-home advertising. With OOH advertising growing fast, particularly in Asia, Glenn detailed how companies can upgrade their campaign strategies with Quadrant’s mobile location data, for example, to measure brand awareness, drive in-store visits and boost ticket sales. For more on the meeting, see here. On International Women’s Day our Director of Engineering, Barkha Jasani urged women forging careers in tech to keep hold of their dreams and embrace challenges. Barkha represented Quadrant in a discussion group with other women in leading tech roles in Singapore aimed at addressing how to support more women to choose tech careers to boost the low female rates and pay gap in the field. Read the full recap here. 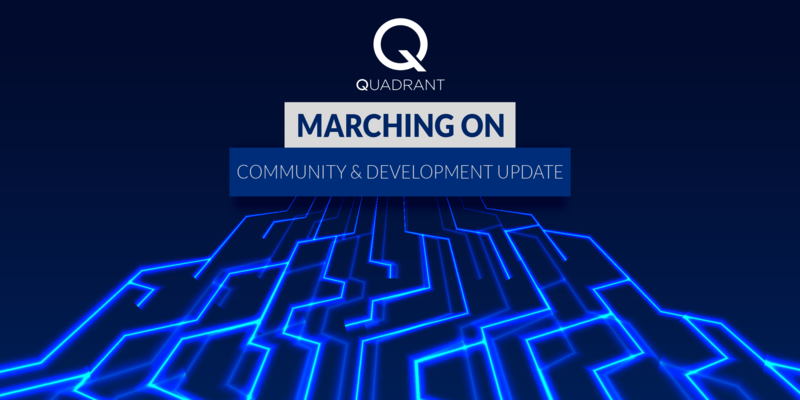 Our local and professional communities are very important to the success of Quadrant, and we are grateful for the opportunity to connect with other data professionals at events such as these. We also want to address recent events at Coinbene, an exchange where eQAUDs trade. On Tuesday, March 26, large numbers of eQUAD and other tokens were moved off of the exchange into wallets belonging to unknown parties. Coinbene has acknowledged there were "abnormal transactions" and says impacted tokens are "under control". We are in contact with Coinbene and will continue to share information related to the situation as we have it. We can assure you that our ability to function as a business and achieve our growth milestones will not be affected, whatever the truth of the situation. Please check this blog as well as Telegram and Twitter for up-to-the-minute updates. But after finishing the first quarter of 2019, we are proud to say we have continued to meet the milestones we set for ourselves when we began this journey a year ago. Looking forward into the next quarter, our focus is on deploying product updates and growing revenue to build lasting value for all of our stakeholders. In particular, Quadrant’s Data Quality Dashboard, the second part of our microservices layer, is slated for release soon after we worked on readying the launch in March. It is designed to help to clean up the ad tech space, using data stamping protocols and other methods to bring high-quality, authentic, verifiable data to buyers. It will help buyers understand and assess the quality of any given set of data, saving them time and reducing processing costs. More details will follow later this month. As always, we are grateful to our customers and the members of our community for your continued support. We are well on the way to reaching our larger goals as an organisation, and we thank you for being part of the journey.